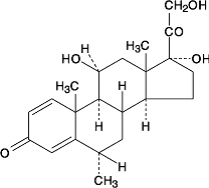 Methylprednisolone Tablets, USP contain methylprednisolone which is a glucocorticoid. Glucocorticoids are adrenocortical steroids, both naturally occurring and synthetic, which are readily absorbed from the gastrointestinal tract. Methylprednisolone occurs as a white to practically white, odorless, crystalline powder. It is sparingly soluble in alcohol, in dioxane, and in methanol, slightly soluble in acetone, and in chloroform, and very slightly soluble in ether. It is practically insoluble in water. Methylprednisolone Tablets, USP, for oral administration, are available as scored tablets in the following strengths: 4 mg, 8 mg, 16 mg, and 32 mg. In addition each tablet contains the following inactive ingredients: colloidal silicon dioxide, lactose anhydrous (4 mg and 8 mg), lactose monohydrate (16 mg and 32 mg), magnesium stearate, microcrystalline cellulose, pregelatinized starch, sodium lauryl sulfate, and sodium starch glycolate. In patients on corticosteroid therapy subjected to unusual stress, increased dosage of rapidly acting corticosteroids before, during, and after the stressful situation is indicated. Usage in pregnancy: Since adequate human reproduction studies have not been done with corticosteroids, the use of these drugs in pregnancy, nursing mothers or women of child-bearing potential requires that the possible benefits of the drug be weighed against the potential hazards to the mother and embryo or fetus. Infants born of mothers who have received substantial doses of corticosteroids during pregnancy, should be carefully observed for signs of hypoadrenalism. The use of Methylprednisolone Tablets in active tuberculosis should be restricted to those cases of fulminating or disseminated tuberculosis in which the corticosteroid is used for the management of the disease in conjunction with an appropriate antituberculous regimen. Children who are on immunosuppressant drugs are more susceptible to infections than healthy children. Chickenpox and measles, for example, can have a more serious or even fatal course in children on immunosuppressant corticosteroids. In such children, or in adults who have not had these diseases, particular care should be taken to avoid exposure. If exposed, therapy with varicella zoster immune globuline (VZIG) or pooled intravenous immunoglobulin (IVIG), as appropriate, may be indicated. If chickenpox develops, treatment with antiviral agents may be considered. Convulsions have been reported with concurrent use of methylprednisolone and cyclosporine. Since concurrent use of these agents results in a mutual inhibition of metabolism, it is possible that adverse events associated with the individual use of either drug may be more apt to occur. Persons who are on immunosuppressant doses of corticosteroids should be warned to avoid exposure to chickenpox or measles and, if exposed, to obtain medical advice. The initial dosage of Methylprednisolone Tablets may vary from 4 mg to 48 mg of methylprednisolone per day depending on the specific disease entity being treated. In situations of less severity lower doses will generally suffice while in selected patients higher initial doses may be required. The initial dosage should be maintained or adjusted until a satisfactory response is noted. If after a reasonable period of time there is a lack of satisfactory clinical response, Methylprednisolone should be discontinued and the patient transferred to other appropriate therapy. IT SHOULD BE EMPHASIZED THAT DOSAGE REQUIREMENTS ARE VARIABLE AND MUST BE INDIVIDUALIZED ON THE BASIS OF THE DISEASE UNDER TREATMENT AND THE RESPONSE OF THE PATIENT. After a favorable response is noted, the proper maintenance dosage should be determined by decreasing the initial drug dosage in small decrements at appropriate time intervals until the lowest dosage which will maintain an adequate clinical response is reached. It should be kept in mind that constant monitoring is needed in regard to drug dosage. 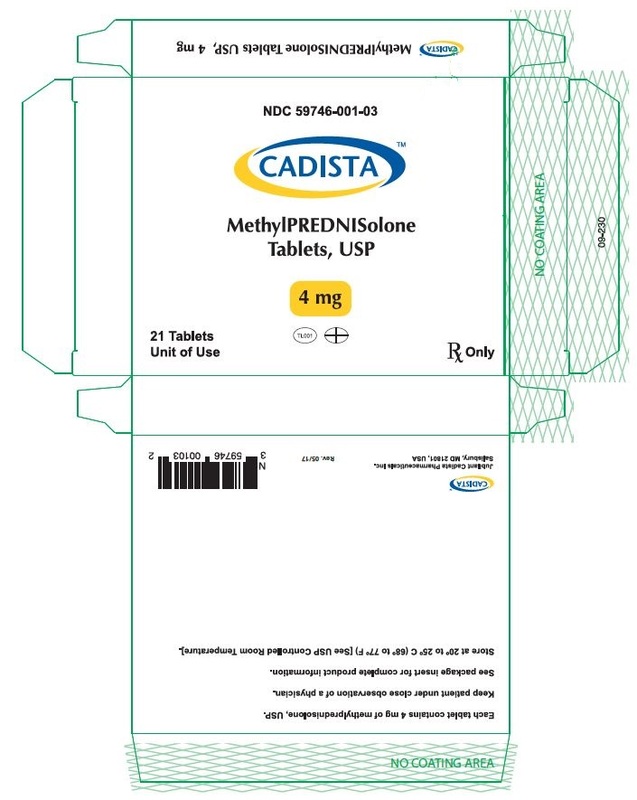 Included in the situations which may make dosage adjustments necessary are changes in clinical status secondary to remissions or exacerbations in the disease process, the patient's individual drug responsiveness, and the effect of patient exposure to stressful situations not directly related to the disease entity under treatment; in this latter situation it may be necessary to increase the dosage of methylprednisolone for a period of time consistent with the patient's condition. If after long-term therapy the drug is to be stopped, it is recommended that it be withdrawn gradually rather than abruptly. Multiple Sclerosis: In treatment of acute exacerbations of multiple sclerosis daily doses of 200 mg of prednisolone for a week followed by 80 mg every other day for 1 month have been shown to be effective (4 mg of methylprednisolone is equivalent to 5 mg of prednisolone). ADT (Alternate Day Therapy): Alternative day therapy is a corticosteroid dosing regimen in which twice the usual daily dose of corticoid is administered every other morning. The purpose of this mode of therapy is to provide the patient requiring long-term pharmacologic dose treatment with the beneficial effects of corticoids while minimizing certain undesirable effects, including pituitary-adrenal suppression, the Cushingoid state, corticoid withdrawal symptoms, and growth suppression in children. The rationale for this treatment schedule is based on two major premises: (a) the anti-inflammatory or therapeutic effect of corticoids persists longer than their physical presence and metabolic effects and (b) administration of the corticosteroid every other morning allows for reestablishment of more nearly normal hypothalamic-pituitary-adrenal (HPA) activity on the off-steroid day. A brief review of the HPA physiology may be helpful in understanding this rationale. Acting primarily through the hypothalamus a fall in free cortisol stimulates the pituitary gland to produce increasing amounts of corticotropin (ACTH) while a rise in free cortisol inhibits ACTH secretion. Normally the HPA system is characterized by diurnal (circadian) rhythm. Serum levels of ACTH rise from a low point about 10 pm to a peak level about 6 am. Increasing levels of ACTH stimulate adrenal cortical activity resulting in a rise in plasma cortisol with maximal levels occurring between 2 am and 8 am. This rise in cortisol dampens ACTH production and in turn adrenal cortical activity. There is a gradual fall in plasma corticoids during the day with lowest levels occurring about midnight. The diurnal rhythm of the HPA axis is lost in Cushing's disease, a syndrome of adrenal cortical hyperfunction characterized by obesity with centripetal fat distribution, thinning of the skin with easy bruisability, muscle wasting with weakness, hypertension, latent diabetes, osteoporosis, electrolyte imbalance, etc. The same clinical findings of hyperadrenocorticism may be noted during long-term pharmacologic dose corticoid therapy administered in conventional daily divided doses. It would appear, then, that a disturbance in the diurnal cycle with maintenance of elevated corticoid values during the night may play a significant role in the development of undesirable corticoid effects. Escape from these constantly elevated plasma levels for even short periods of time may be instrumental in protecting against undesirable pharmacologic effects. During conventional pharmacologic dose corticosteroid therapy, ACTH production is inhibited with subsequent suppression of cortisol production by the adrenal cortex. Recovery time for normal HPA activity is variable depending upon the dose and duration of treatment. During this time the patient is vulnerable to any stressful situation. Although it has been shown that there is considerably less adrenal suppression following a single morning dose of prednisolone (10 mg) as opposed to a quarter of that dose administered every six hours, there is evidence that some suppressive effect on adrenal activity may be carried over into the following day when pharmacologic doses are used. Further, it has been shown that a single dose of certain corticosteroids will produce adrenal cortical suppression for two or more days. Other corticoids, including methylprednisolone, hydrocortisone, prednisone, and prednisolone, are considered to be short acting (producing adrenal cortical suppression for 1¼ to 1½ days following a single dose) and thus are recommended for alternate day therapy. Because of the advantages of ADT, it may be desirable to try patients on this form of therapy who have been on daily corticoids for long periods of time (eg, patients with rheumatoid arthritis). Since these patients may already have a suppressed HPA axis, establishing them on ADT may be difficult and not always successful. However, it is recommended that regular attempts be made to change them over. It may be helpful to triple or even quadruple the daily maintenance dose and administer this every other day rather than just doubling the daily dose if difficulty is encountered. Once the patient is again controlled, an attempt should be made to reduce this dose to a minimum. As indicated above, certain corticosteroids, because of their prolonged suppressive effect on adrenal activity, are not recommended for alternate day therapy (eg, dexamethasone and betamethasone). In the event of an acute flare-up of the disease process, it may be necessary to return to a full suppressive daily divided corticoid dose for control. Once control is again established alternate day therapy may be reinstituted. Store at 20 to 25° C (68 to 77° F) [see USP Controlled Room Temperature]. See package insert for complete product information. Dispense in tight, light resistant container. Keep patient under close observation of a physician. Each tablet contains 4 mg of methylprednisolone, USP. Store at 20-25°C (68-77°F) [See USP Controlled Room Temperature]. Take 2 tablets before breakfast, 1 tablet after lunch and supper, and 2 tablets at bedtime. Take 1 tablet before breakfast, 1 tablet after lunch and supper, and 2 tablets at bedtime. Take 1 tablet before breakfast and 1 tablet after lunch, after supper, and at bedtime. Take 1 tablet before breakfast, after lunch, and at bedtime. Take 1 tablet before breakfast and at bedtime. 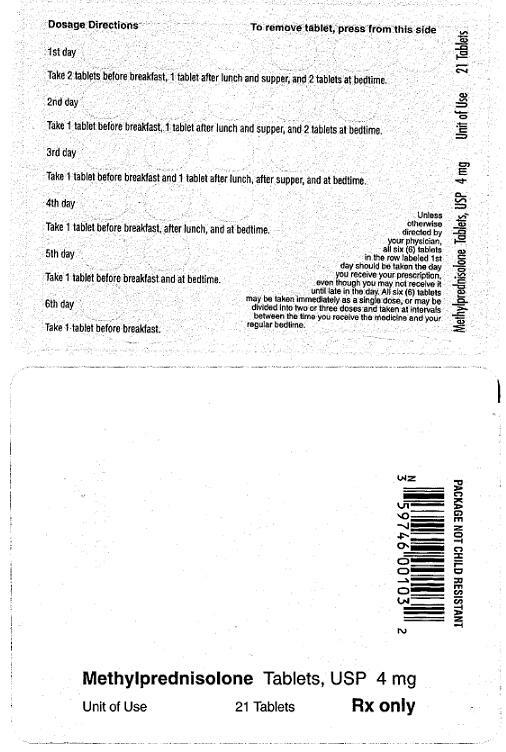 Take 1 tablet before breakfast. Unless otherwise directed by your physician, all six (6) tablets in the row labeled 1st day should be taken the day you receive your prescription, even though you may not receive it until late in the day. All six (6) tablets may be taken immediately as a single dose, or may be divided into two or three doses and taken at intervals between the time you receive the medicine and your regular bedtime.